Corinne Olsen regards herself as a rock star who happens to play classical instruments, equally comfortable sitting in a symphony orchestra or head banging in a rock band. From an early point in her performance career, Corinne discovered she would rather play music people recognized than follow the classical repertoire. Luckily, her studies provided opportunities to play a little bit of everything – rock, Broadway, symphonies, chamber, movie soundtracks – all before entering college. Corinne is a freelance violinist and violist throughout Southern California. She is a member of the Golden State Pops Orchestra in San Pedro and featured violist for rock musician Avery Watts. Other groups she appears with, past and present, include Southeast Symphony, the Brentwood-Westwood Symphony, the Corona Symphony, Sucré, Sleeping At Last, Bamboo, and premiere Led Zeppelin tribute band Led Zepagain, to name a few. She received her Master of Music, Viola Performance from California State University, Long Beach and holds a Bachelor of Music, Violin Performance with a minor in Music Business from the Crane School of Music at SUNY Potsdam. 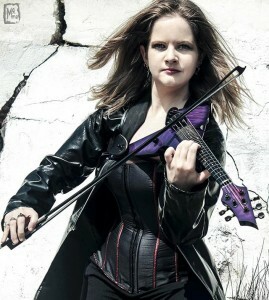 Corinne plays a Wood Violins Viper and is proud to be an endorsed artist with D’Addario Bowed Strings.